The second round of TOC Sneak Peeks highlighted three new publishing startups. Their market areas included content curation, app creation for non-geeks, and multitouch content control. BookRiff: Ever want to compile your own cookbook, travel guide or textbook? Has your publisher edited out sections of your book you’d like to share with interested readers? 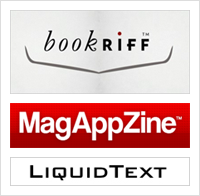 Publishing startup BookRiff aims to solve these problems by creating new ways to access and compile content. In an interview, company CEO Rochelle Grayson (@RochelleGrayson) talked about how BookRiff works and how it can benefit publishers and consumers. She said her company is based on an open market concept, allowing publishers to sell the content they want at prices they set and consumers to buy and customize that content as they see fit. Read the BookRiff interview here. MagAppZine: This startup is a platform that allows publishers to create custom apps without a lot of overhead. In an interview, company founder Paul Canetti (@paulcanetti), who worked at Apple during the birth of the iPhone and the subsequent app revolution, talks about how MagAppZine works and the benefits he sees for publishers. Read the MagAppZine interview here. LiquidText: In an interview, company founder and CEO Craig Tashman (@CraigTashman) said his annotation and document manipulation software began as an academic project, but commercial applications quickly became clear. The software allows users to annotate, highlight and manipulate PDF content with multitouch gestures. LiquidText may be the next major step toward making etextbooks more practical for students — and it’s another nail in the coffin for the “death of marginalia” debate. Read the LiquidText interview here. After spending the past 12 years at Poynter blogging and aggregating news (which he started doing before anyone even knew what those words meant), Jim Romenesko announced his retirement this week. Well, semi-retirement. Julie Moos, director of Poynter Online and Poynter Publications, explained in an announcement that Romenesko will continue posting part-time at Poynter. The Romenesko blog will live on, but under its new name, “Romenesko+” — the “+” designates an expanded staff that will include Romenesko and co-posters Julie Moos, Steve Myers and Jeff Sonderman. So, though an end of an era might have been reached with Romensko’s semi-retirement, being Romenesko’d might still be in the cards. Jer Thorp (@blprnt), data artist in residence at The New York Times, was tasked a few years ago with designing an algorithm for the placement of the names on the 9/11 memorial. If an algorithm sounds unnecessarily complex for what seems like a basic bit of organization, consider this: Designer Michael Arad envisioned names being arranged according to “meaningful adjacencies,” rather than by age or alphabetical order. The project, says Thorp, is a reminder that data is connected to people, to real lives, and to the real world. I recently spoke with Thorp about the challenges that come with this type of work and the relationship between data, art and science. Thorp will expand on many of these ideas in his session at next month’s Strata Conference in New York City. How do aesthetics change our understanding of data? Jer Thorp: I’m certainly interested in the aesthetic of data, but I rarely think when I start a project “let’s make something beautiful.” What we see as beauty in a data visualization is typically pattern and symmetry — something that often emerges when you find the “right” way, or one of the right ways, to represent a particular dataset. I don’t really set out for beauty, but if the result is beautiful, I’ve probably done something right. My work ranges from practical to conceptual. In the utilitarian projects I try not to add aesthetic elements unless they are necessary for communication. In the more conceptual projects, I’ll often push the acceptable limits of complexity and disorder to make the piece more effective. Of course, often these more abstract pieces get mistaken for infographics, and I’ve had my fair share Internet comment bashing as a result. Which I kind of like, in some sort of masochistic way. What’s it like working as a data artist at the New York Times? What are the biggest challenges you face? Jer Thorp: I work in the R&D Group at the New York Times, which is tasked to think about what media production and consumption will look like in the next three years or so. So we’re kind of a near-futurist department. I’ve spent the last year working on Project Cascade, which is a really novel system for visualizing large-scale sharing systems in real time. We’re using it to analyze how New York Times content gets shared through Twitter, but it could be used to look at any sharing system — meme dispersal, STD spread, etc. The system runs live on a five-screen video wall outside the lab, and it gives us a dynamic, exploratory look at the vast conversation that is occurring at any time around New York Times articles, blog posts, etc. It’s frankly amazing to be able to work in a group where we’re encouraged to take the novel path. Too many “R&D” departments, particularly in advertising agencies, are really production departments that happen to do work with augmented reality, or big data, or whatever else is trendy at the moment. There’s an “R” in R&D for a reason, and I’m lucky to be in a place where we’re given a lot of room to roam. Most of the credit for this goes to Michael Zimbalist, who is a great thinker and has an uncanny sense of the future. Add to that a soundly brilliant design and development team and you get a perfect creative storm.